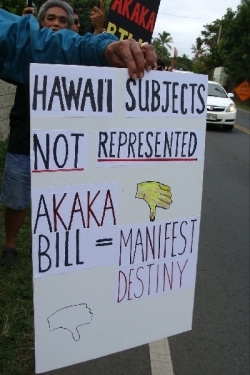 As the Sovereign Authority of the Hawaiian Kingdom Government and Sovereign Hawaiian Nation, a Government and Nation completely foreign to your own, I now address you from and upon my own soil; It is my solemn duty to notify a fellow world leader of important matters of state which directly affect them or their nation, without the encumbrance of appeasement, when active treaty between our states is in force, but also having been breeched. 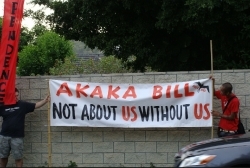 Although there are numerous important issues to discuss regarding the fate of our two nations, this letter remains focused towards that most pressing subject matter now before your administration for consideration; The Akaka Bill. Know that my patience has run its course regarding this Lazarus-styled legislation, which continues to be a mockery and endangerment to the welfare and national security of my people, my Kingdom and those that live thereon and therein. 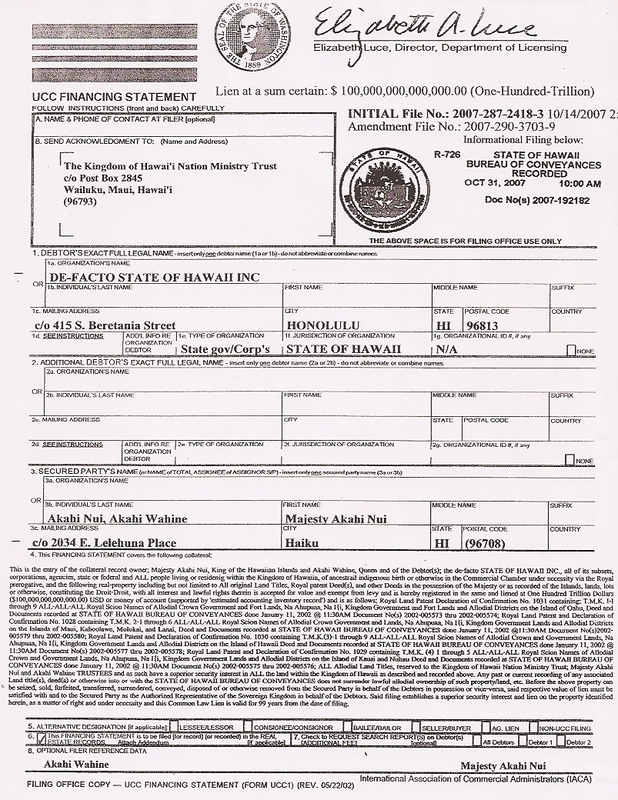 We first laid this business to rest when convincing [U.S.] Congress of its non-applicability for Hawaii in 1998. So why does it continually rise from the grave? 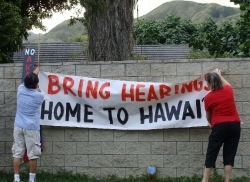 Because it is the de-facto State of Hawaii's attempt to mitigate their criminal liability against me and my people, as I now summon them into the hallowed world courts of criminal justice. 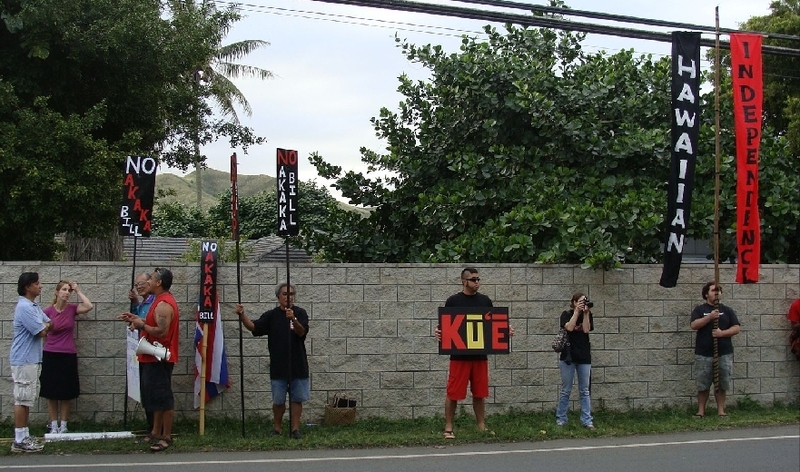 If anyone (including you and your administration) should collude in supporting the alleviation of their crimes, I shall most eagerly take them right into the world courts along with these [State of Hawaii] agents and "officers". Therefore it is very important to thoroughly investigate all economic and lawful implications surrounding this legislation before taking any action. A very long, hard look at all ramifications any and all actions your Office (and Congress) may pursue will reveal an unrecoverable economic and lawful position, should you proceed with its signing into law. 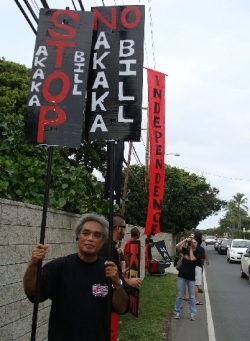 To go only by the sorely misinformed fore-gone conclusion that Hawaii is part and parcel of the continental de-facto United States Corporation without closer scrutiny, and then acting as such no other [international] conditions of state exist, would be imprudent. 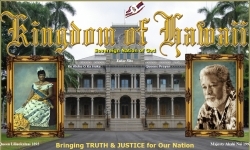 8) As the Sovereign Authority and the King of Hawaii, my duty to protect my people and their welfare, and the welfare of my Kingdom and country, against any and all threats, both foreign and domestic, which supersedes any intent by [your] foreign commercial interests to generally nullify or stultify international liability. I shall not hesitate to bring anyone responsible for the compromise and/or the continued injury to my Kingdom's national security, or threat to its welfare or any other interest(s) by any agent(s) or officer(s) of the same, US Government et al., before the eyes of the world and America, if you or your administration continues its previous course of action and policy in this matter. into a gentrified form of corporate property, as cultural and political wards of state for your United States Federal Corporation, and as such, these actions threaten my national security, our peace and safety with continuing practices of long-standing Acts of Terrorism against me, my people and my Kingdom. Know Mr. President, I am now moving towards an appropriate remedy. 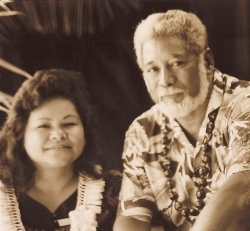 I consider you, as CEO of the United States Corporation, that parent corporation to the STATE OF HAWAII, Inc, and the United States Corporation, responsible for both the actions of STATE OF HAWAII, and its long-standing unlawful commercial coup d'état, against my Kingdom and its people. 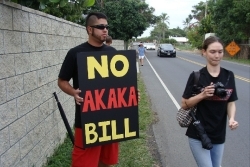 The STATE OF HAWAII as well as any county or federal authority is foreign to my soil. 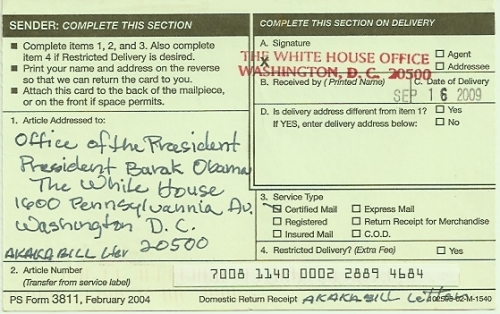 Mr. President, please respond to my letter within 20 days, or I shall publish it for public view on my website and other portals and news wires of [international] public interest. If I do not hear from you in that time, I will give notice of your fault; your tacit standing forevermore representing agreement with our claims, position, rights, titles and interest as correct and perfected. Whereupon I shall proceed this issue into international courts and tribunals of applicable jurisdiction, including attachment of domestic foreign assets for settlement of debt. If you would like a private audience with me to discuss these issues, then do not hesitate to contact me on my personal lines at; 808-000-0000, hrm@hrmakahinui.com. Thank you for taking time to consider this most important issue.